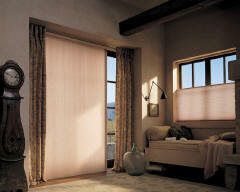 Hunter Douglas vertical shades are well suited for windows that are wider than they are tall and slide from side to side. 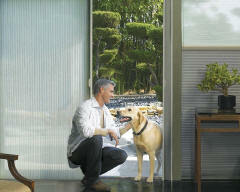 They provide the perfect solution for sliding glass doors and more. This collection features a state-of-the-art, patented, honeycomb-within-honeycomb design offering the industry’s highest level of energy efficiency. The Hunter Douglas Vertiglide™ vertical pleat window treatment system is the ideal choice for side-to-side openings, sliding glass doors or as a room divider. 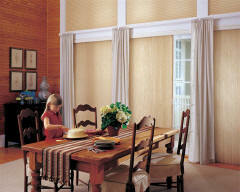 With a wide array of fabrics, pleat sizes, colors and textures, Duette honeycomb shades enhance any décor and provide superior energy efficiency. The Hunter Douglas Vertiglide™ vertical pleat widnow treatment system is the ideal choice for side-toside openings, sliding glass doors or as a room divider. 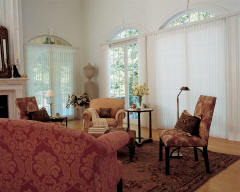 Luminette Privacy Sheers marry the beauty of sheers with the privacy of soft draperies. Available in a side or split stack design, these vertical sheer window treatments are especially suited for larger, rectangular windows and sliding glass doors. Applause honeycomb shades are the right choice when looking for energy savings and value with the enduring quality of the Hunter Douglas brand. The Hunter Douglas Vertiglide™ vertical pleat window treatment system is the ideal choice for side-toside opening, sliding glass doors or as a room divider.